ECS has announced it is to unveil four new notebook computer series at CeBIT in Hannover later this week. The new notebook computer series are the first since the recent merger between Uniwill and ECS, and will support both Windows XP and Vista. The S series is aimed towards "mobile workers and fashion conscious" users and are available with a variety of LCD screen sizes stretching from 12.1 inches to 14.1 inches. 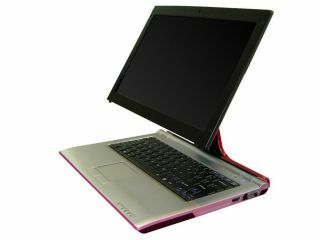 The 12.1-inch ECS S20II combines Intel Core 2 Duo technology, Windows Vista support and includes features such as Bluetooth and a built-in 1.3-megapixel camera. ECS claims its L Series offers one of the best price/performance ratios in the industry. Featuring processors from both Intel and AMD, the L series notebook computers will have LCD displays ranging from 14.1 inches to 17 inches. This is ECS' new UMPC, to be officially unveiled at CeBIT. The first model that will be launched is the ECS H70 which features a touch screen 7-inch display and stylus input, as well as a 4-in-1 card reader and 1.3-megapixel camera. ECS said it aims for the H70 to be a "gadget for the masses". The G Series includes the ECS G200. This model (pictured), features an ergonomic 'neck' that connects the display panel and the base, allowing the screen to be lifted, tilted or swivelled to the most comfortable position for the user. No pricing or availability details have been given at this stage.